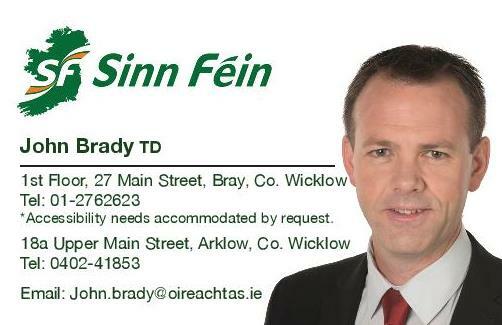 Sinn Féin TD for Wicklow/East Carlow John Brady has expressed his shock at the news that Ardmore Studios in Bray is to be sold as a going concern. “Ardmore Studios are internationally renowned as Ireland’s leading provider of film and TV studio infrastructure. “The Studios is highly regarded by the community in Bray and has been home to hundreds of national and international film and TV productions since it was established in 1958. “While I accept that the news of this sale comes with an assurance that it will not impact on the day to day running of the studios this provides little comfort. "Last year, it emerged that a stakeholder in Ardmore Studios had expressed considerable disquiet at plans for key directors in Ardmore to set up a rival studio in Limerick putting both studios in direct competition. "I believe that the development in Limerick is at an advanced stage and this may raise these past concerns again. “I am aware that Ardmore Studios are in advanced planning stages with some expansion completed as recently as this year and further expansion to follow. I will do everything within my power to ensure that the valuable site at Ardmore is protected and that zoning remains in place solely for the expansion of film and tv production only. “I met with Ardmore Studios last year and I fully intend to meet with them on this matter as soon as possible. Any threat to such a significant media hub is of national concern and will be of grave concern particularly, to the people of Bray.